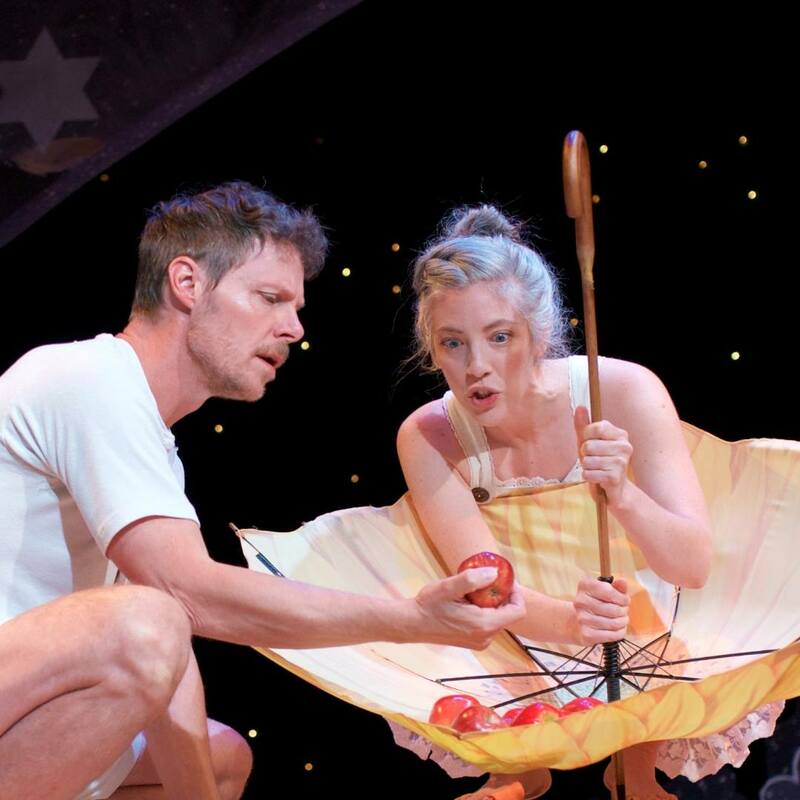 Rosebuds newest show, The Diaries of Adam and Eve, is a brilliant rendition of Mark Twain’s classic story. This comedic take on the biblical tale had the audience laughing from the first line. Twain’s interpretation of this biblical narrative shows Adam and Eve’s thoughts through their diaries when they first come to the Garden of Eden. The story progresses in an intriguing and humorous way as the titular characters discover more about the world around them. The play runs for around 80 minutes and has a cast and crew of 15 people. This story is one that can be enjoyed thoroughly whether you are familiarized with the original or not. Our characters begin causing laughs and confusion right into the show. Just as we, the viewers, may be confused by what is going on, the actors seem to be too. Adam and Eve behave exactly how you would expect someone to if they were suddenly brought into existence knowing nearly nothing. Confused and fascinated by the world around them the pair search the realm of their garden separately to begin, knowing only the English language, and in some cases not even that much. Eve has a knack for instantly knowing what something is once having laid eyes upon it. Adam, however, tends to take a more creative way of naming things. He also is there to provide commentary on things you’ve likely never thought about, such as a Dodo bird. Why on Eden were they named that? Both Adam and Eve tend to fall into some male and female tropes that are common these days, the stereotypes had to come from something. Wide-eyed and adventurous Eve tries to learn as much as she can about everything, nurturing and loving each and every animal she comes across. Adam has a more hands-on approach, preferring to experiment and consider consequences later. Although not keen on each other in the beginning, luckily enough for humanity’s sake they start becoming fond of one another. Curiosity gets the best of Eve, as she makes a decision with repercussions for the both of them, and the ages to come. We get to see Adam and Eve’s bond grow and flourish through this show just as many have experienced young love. To quote the director Morris Ertman, “There are times when it seems the only two people in the world are the ones in the middle of courtship.” Ertman’s production exemplifies this experience in one’s life with humour, deep questions, and serious emotions at some points that one can feel throughout the audience. The actors in this performance portrayed the characters perfectly. They brought the audience into the scene while keeping the plot lively and comical. Despite there only being two actors, the show still kept a great pace, there wasn’t a dull moment in the entire show. The characters themselves were extremely well written, both being created with a somewhat stereotypical nature to them. Eve is created to be a chatty and energetic presence who is in constant need of companionship, whereas Adam is shown to be a reserved apathetic character wishing for more independence. The growth of these characters through the play is exceptional and done perfectly by these actors. It was an overall spot-on performance by two brilliant actors. However, these are not the only two people that deserve recognition. This performance could not have been done without the talent of those backstage. Under the direction of Morris Ertman, and with the help of Heather Pattengale (Eve) they were able to adapt the show to the perfection we see on stage. Ertman was also the scenic director in this show, his talents really got a chance to shine as his vision was formed into a world that will make you feel as though you are right beside the characters in the Garden. He wasn’t alone in this creation, he was joined by the head scenic carpenter, Stephen Ellerbeck (a member of Rosebud School of the Arts), and head scenic artist Cheryl Daughely. This team of creators made a wonderful scene with climbable props and perfectly rendered trees. And while this show isn’t a musical, it still has wonderfully composed music placed in the perfect spots. This performance was overall spectacular and will make you laugh until your stomach hurts. While the language and humour may be a little bit challenging for younger people to understand, I would still recommend this to anyone who enjoys the theatre. This short romantic-comedy is perfect for older viewers and still has portions for the younger viewers to laugh along with. I would highly recommend bringing your parents to this show, it is a memorable one and its unpredictability will have you sitting on the edge of your seat waiting to see what could possibly happen next. The best way to understand what this show is really about is to see it yourself. The performances of The Diaries of Adam and Eve go from September 7th to October 20th, you can find available tickets at https://www.rosebudtheatre.com/shows.